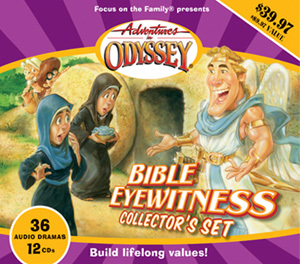 In each of these previously released Odyssey episodes, kids won't just hear stories from the Bible - they'll experience all the thrills as a Bible eyewitness! As each story of faith comes to life in a new way, kids will understand the Bible better than ever. A KYDS Radio OT Action News broadcast about Abraham and Lot. Bernard and Eugene tell the story of the Fiery Furnace. OT Action News returns to tell the story of when the Israelites invaded the land of Canaan, specifically the town of Jericho. Connie Kendall relates the tragedy and hardships of a young woman named Ruth, who risks all to stay committed to her dead husband's family. She finds true love in an unlikely place. Ever heard of Saul from 1 Samuel? It all started in the days of judges. Saul mostly kept to himself, never really getting the fame he so richly deserved. But, he was made for great things!